I have just returned from a month in the Democratic Republic of the Congo that confirmed my long held conviction that the DRC is the most musical country on the planet. 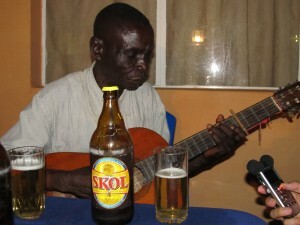 Often called the beating heart of Central Africa, Kinshasa―despite the city’s many problems―remains obsessed with music. From thousands of churches, from the bars of Matonge and Bandal, to the hundreds of neighborhood groups rehearsing in courtyards across the megalopolis, to the upscale nightclubs of the Gombe neighborhood, thousands of musicians draw from the creative life force that, against all logic and odds, keeps Kinshasa from imploding under the weight of its absurdities. Like the dreamers and schemers who head, from throughout the country, to the diamond fields of the Kasai provinces looking for the Moko Moko―the massive gem diamond―that will forever change their lives, musicians from across the DRC migrate to Kinshasa determined to make their fortunes. This river of musical migrants, from all four corners of the country, has been flowing swiftly since the first recording studios were opened in Leopoldville, back in the 1930s. Of all these early Leopoldville studios, none could match the successes of Ngoma Records, a label started in 1947 by two Greek brothers who imported and distributed domestic goods. With massive hits like “Marie Louise” by Wendo Kolosoy, Ngoma helped birth the Congolese rumba. The label also featured many artists who performed regional styles that drew on “traditional” repertoires. 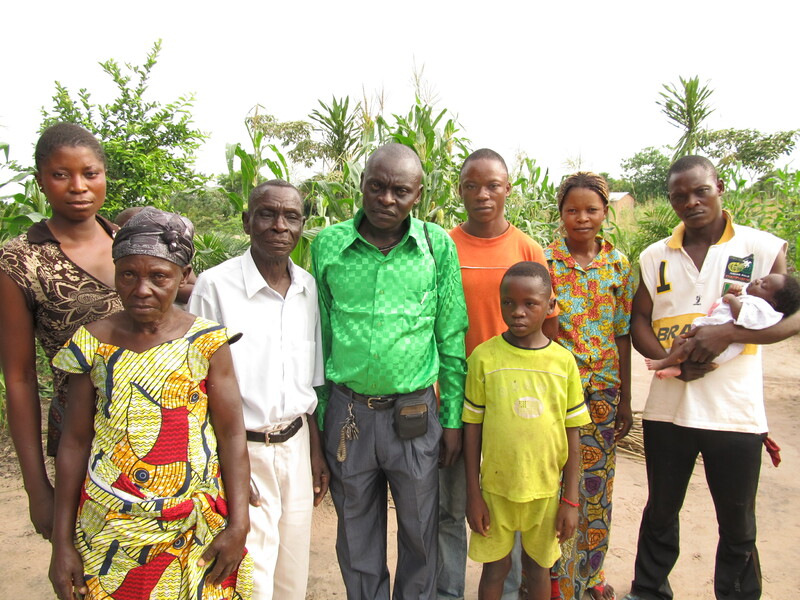 Last month, in Mbuji Mayi, the capital of the Kasai Oriental province, I had the good fortune to meet Ntita Albert Lubumbula, who was a member of one of the first Baluba groups to record for les Editions Ngoma. In 1957, Ntita Albert was brought to Leopoldville for six months by Nikiforos Cavvadias, who then managed les Editions Ngoma. 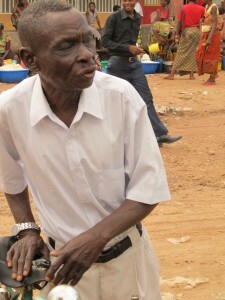 Ntita Albert Lubumbula was born, in 1930, in Bakwanga, the town that since 1966 has been known as Mbuji Mayi. Papa Albert remembers spending hours of his childhood listening to the 78 rpm recordings that a local shopkeeper would spin on his victrola. 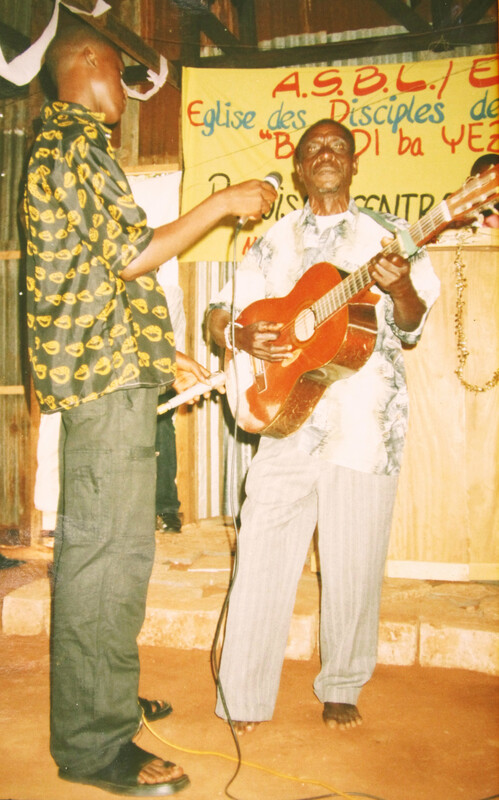 His favorite artists were Wendo Kolosoy and Leon Bukasa. 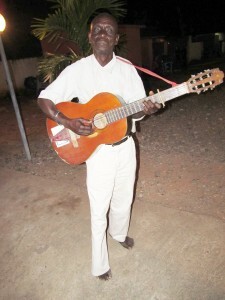 In the mid 1940s one of Albert’s cousins taught him how to tune and finger a few chords on the guitar, and by the early 1950s Ntita Albert was one of Bakwanga’s more talented instrumentalists. 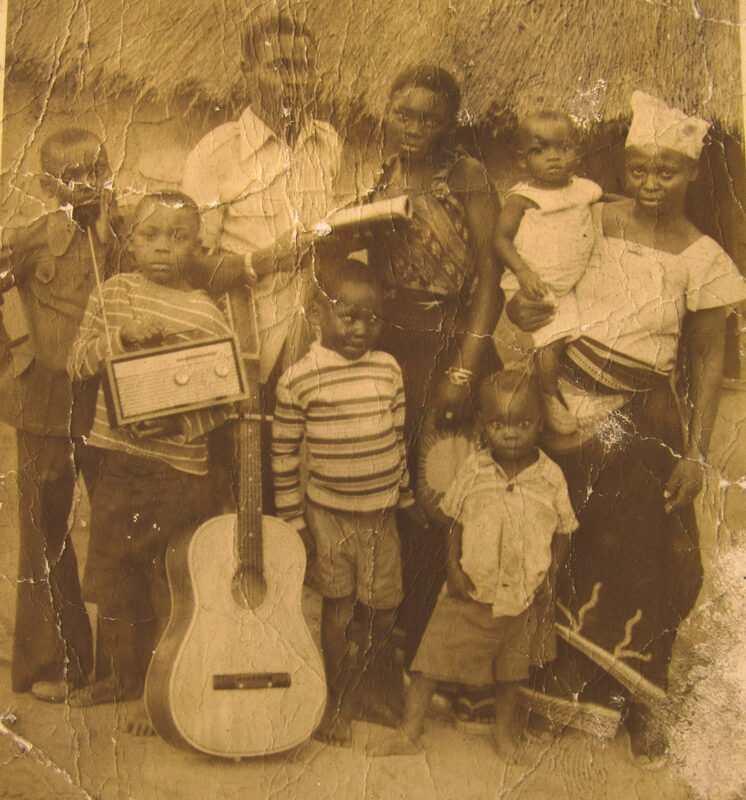 By the mid 1950s, he was the guitar player for a popular Mbuji Mayi group that performed modern arrangements of Baluba melodies. 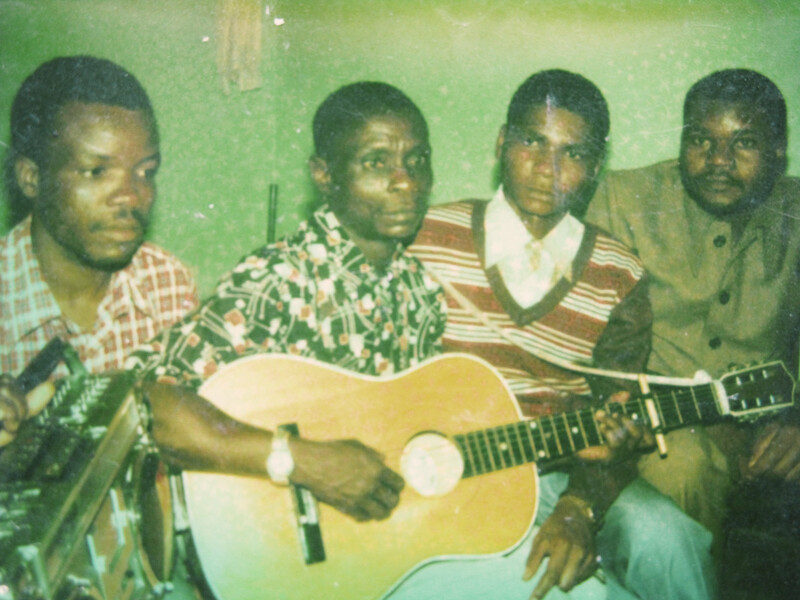 In 1957, during a long residency in Elisabethville (now Lubumbashi), the group was asked to share a bill with the Trio Bow (Bukasa, D’Oliveira, and Wendo). Nikoforos Cavvadias, who had accompanied the Trio Bow to Elisabethville, was impressed by the trio of Baluba musicians who opened the show. A few months later, Cavvadias invited the trio from Mbuji Mayi to Lubumbashi to record for les Editions Ngoma. 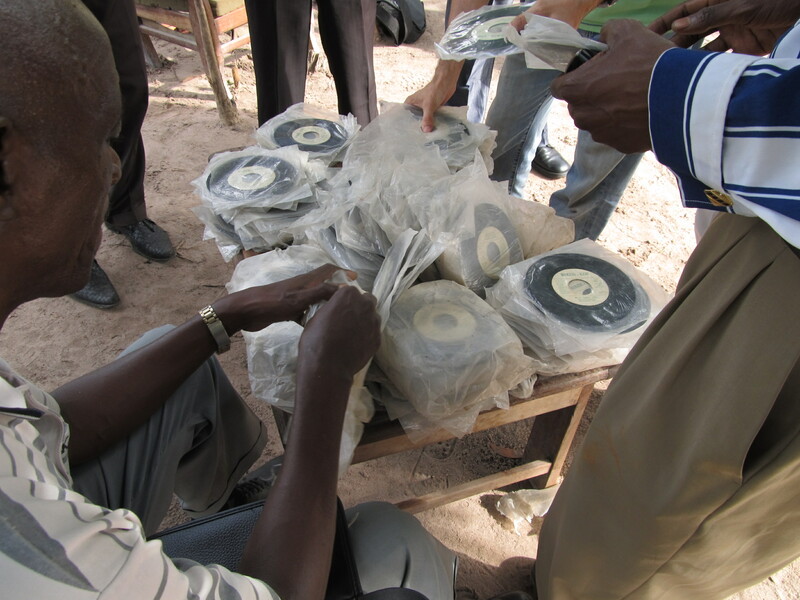 Ntita Albert and his colleagues spent six months in Leopoldville and released four 78 rpm recordings. The group from the Kasai spent six months in Leopoldville, and Papa Albert still has fond memories of the many hours he spent with his friend Wendo Kolosoy. For the next twenty years, the trio toured throughout the Democratic Republic of the Congo, building on the popularity generated by their Ngoma singles. After two decades of performing together, the trio split apart in the early 1980s, when the bandleader decided to move to Kinshasa. 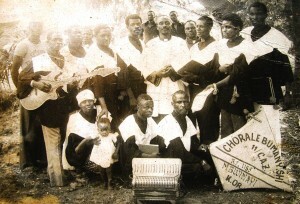 Ntita Albert stayed in Mbuji Mayi and formed the Groupe Dinanga. Encouraged by a wealthy patron, who paid for his plane tickets to Kinshasa and financed a long stay in the capital, Ntita Albert recorded a half-dozen singles for the Bukebi-Kebi label; singles that he hoped would relaunch his career. The tracks were laid down by the Pere Buffalo at the Studio Renapec in downtown Kinshasa, and Papa Albert returned to Mbuji Mayi in 1982 with a few thousand 45s. 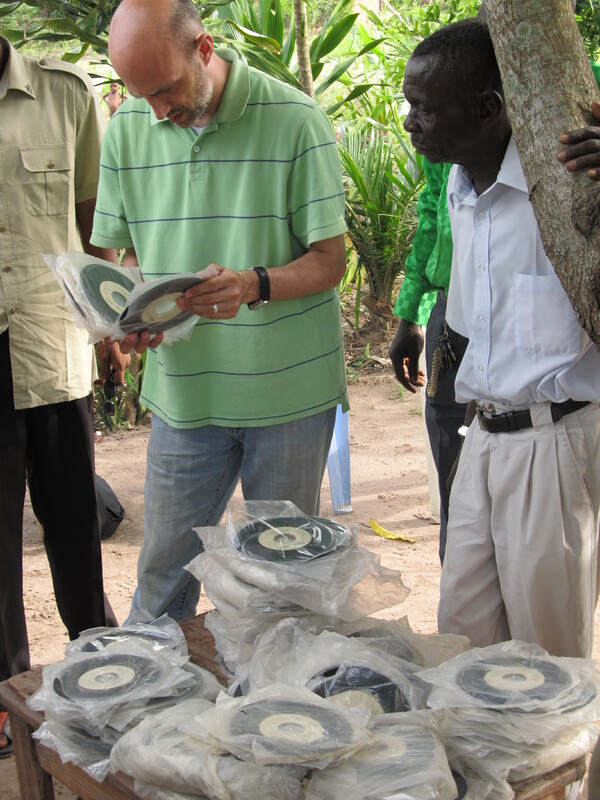 Unfortunately, Papa Albert’s vinyl investment coincided with the arrival of the cassette tape in Mbuji Mayi. He never sold his stock of 45s and his career never regained its momentum. For the last several decades Ntita Albert has continued to perform, making occasional appearances on local television programs, or at local events, but he has not played outside of Mbuji Mayi since 1982. For many years he was able to keep a group together, but for the decade he has been performing solo. At the end of a long interview, Ntita Albert mentioned that he had a thousand 45s in his house that he didn’t know what to do with. I asked if I could take a look at them the following afternoon. Sixteen hours later we met Ntita Albert in the Bipemba neighborhood of Mbuji Mayi, and followed him to a small hut surrounded by cornfields, deep in the rural fringe of the city. 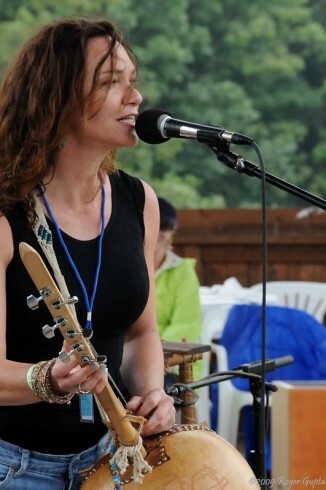 Under the shade of a large mango tree, Ntita Albert laid piles of unplayed 45s on a small wooden table. Special thanks to Pasteur Celestin, the staff of the Hotel Ka Be de Luxe, Mbuji Mayi, Dieudonne of RTDK, and especially to Godefroid for putting the Landcruiser through the ringer getting to Ntita Albert’s house. Over the course of a month in the DRC we recorded a dozen musical groups and a hundred interviews. The only interview I did not record was my long conversation, through a few translators, with Ntita Albert. As fate would have it, the only thing I lost during my month of traveling was the notebook that contained this interview with Ntita Albert, as well as his phone number. As soon as I realized I had lost the notebook, I wrote down what I remembered from our conversation. I am still trying to get back in touch with Ntita Albert to fill in the details that have slipped my memory. The long recording of Papa Albert was made on an Olympus LS-11. Dear Friend. This is a wonderful post, but it worries me also a bit. It seems to me you went back to the Kongo in search of Ntita Albert and you never came out the bush. Because it has been so long since you last worked on this blog. My daughter and I are going to Mbuji-Mayi in October to visit two children at the Saint Joseph orphanage that she is going to adopt. Do you have suggestions on the best hotel at which to stay?